I wonder how many items above you owned or used? The ceiling light shades bring back memories from my childhood and we had one of those old glass washboards, it came from my paternal grandmother’s home in County Clare. 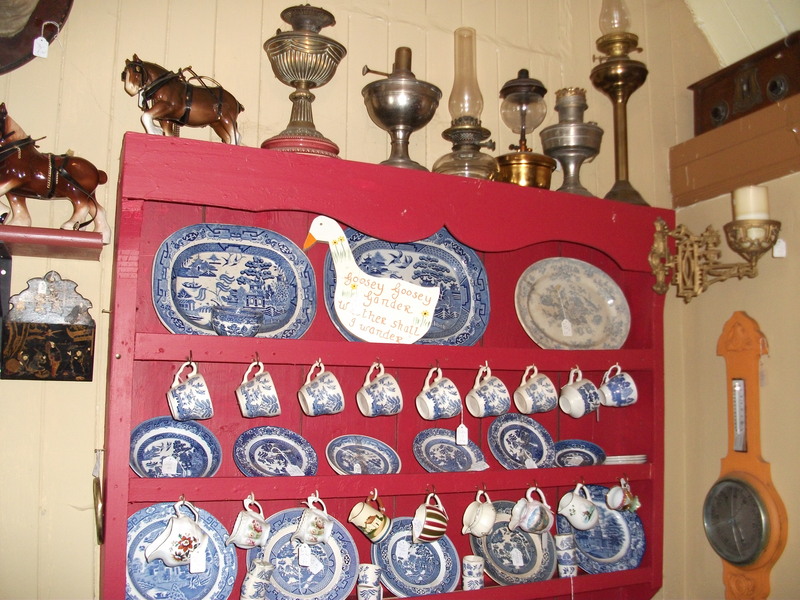 I remember visiting homes where bric-à-brac had a place of honour on mantelpieces, cluttered tables, and shelves, or was displayed in cabinets with glass doors to display the items within while protecting them from dust. Willow pattern tea sets with large breakfast cups were in everyday use in my other granny’s kitchen. 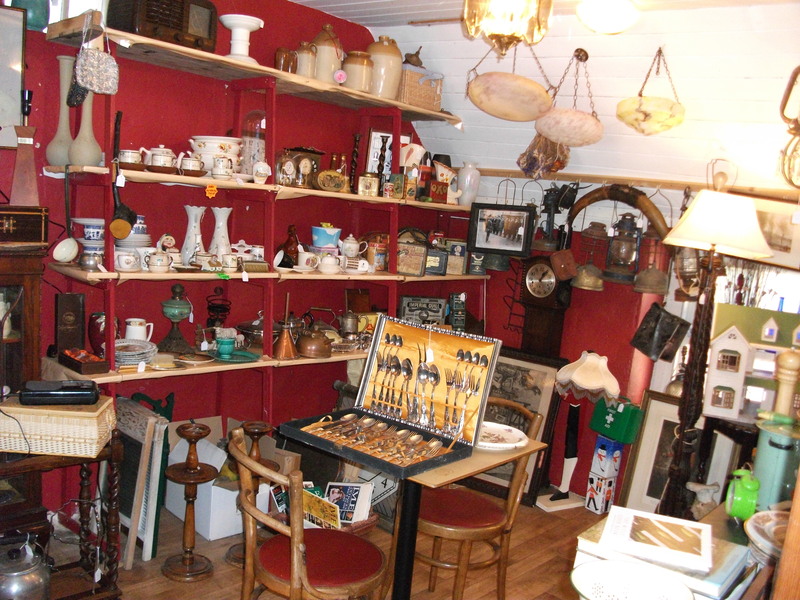 “Bric-à-brac” nowadays refers to a selection of items of modest value, often sold in street markets or shops like the one above. 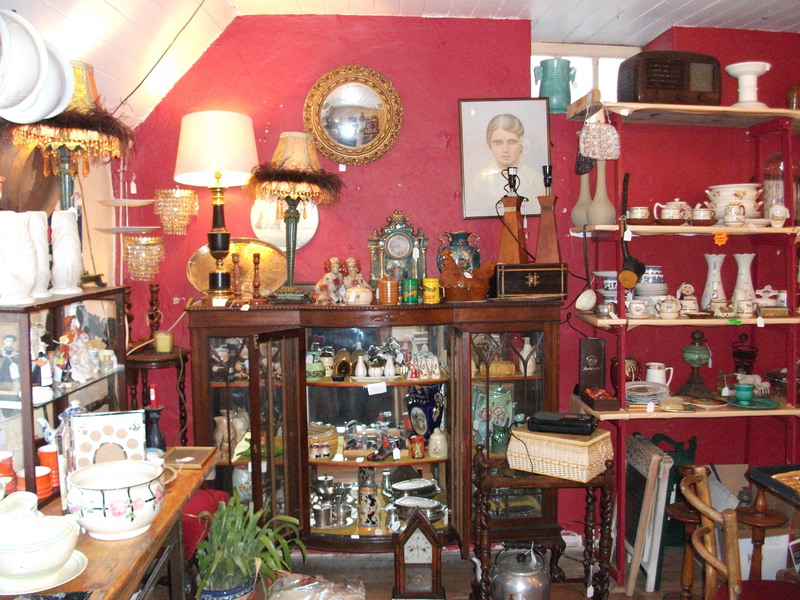 This entry was posted in Alphabet, memories, Photography and tagged Alphabet, Bric-à-brac, Ireland, Memories, Photography, Shelves on June 29, 2013 by Grannymar. Puppy Love, was a popular song written by Paul Anka in 1960 for Annette Funicello, whom he was dating at the time. Twelve years later it was revived by Donny Osmond. Puppy Love is often described as a young love infatuation similar to a crush. It is often one sided and not reciprocated. I was never a slushy crushy person. For a relationship to work in my book, it has to a 50/50 total respect. The topic this week for our LBC members (you will find their links in the sidebar) was dreamed up by Ramana I look forward to discovering the angle on Puppy Love that they each write about. This entry was posted in Loose Consortium Blogging and tagged Buffy, LBC, Loose Blogging Consortium, Puppy love on June 28, 2013 by Grannymar. The Jehovah’s Witness said, “Beats me. Nobody ever let me in before. Frank, is this what you do with all cold callers? This entry was posted in humour and tagged Humour on June 27, 2013 by Grannymar. I knew that one day they would get me in trouble!!!!! Nobody will be able to find me ever, Ever, EVER again. E V E R.
Well, not at least until…. Friday. Maybe by then I might be forgiven. It is not really my fault, you know. I had a date with a Toyboy for one of the clock today, so I bounced out of the bed before 6 am, and into the shower. Then began the polyfilla programme it is a long slow process, but worth it for the results. Flexible, crack-free filling between two surfaces where movement can occur. Easily controlled application for long linear gaps. Remove cap and carefully cut top from nozzle with a sharp knife to the size of hole I required. Squeeze the tube to force out the filler and move along the repair wrinkle. The filler was smoothed with a wet rounded spatula or dowel. I use my finger. Then wipe off excess before it dries. It can be over painted when dry. Read: You can use makeup on top of it! For best results the area to be filled should be no more than 20mm wide by 12mm deep. I’m well within that limit, my wrinkles are not that deep, I think! 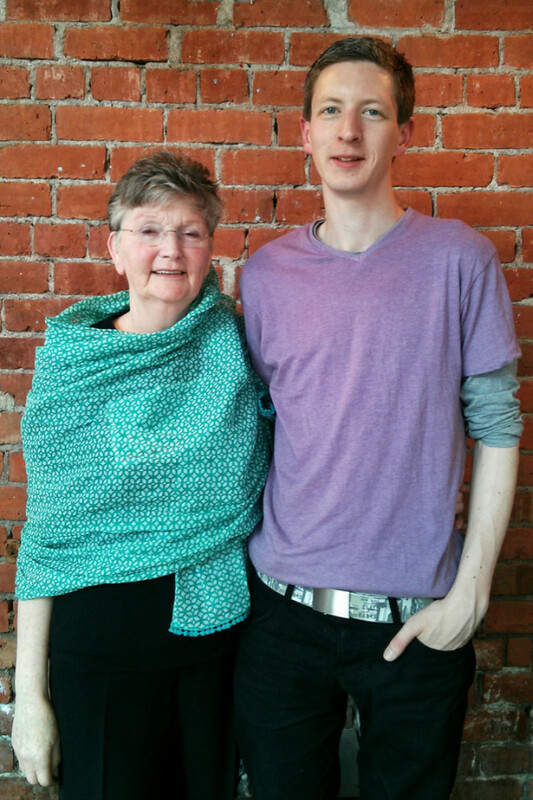 After breakfast, I headed for the hairdressers –Looking like an overgrown weed garden was not the look for me. Not when I was meeting a Toyboy! Could we delay the meet-up, just a little, something had occurred that needed attention. Now being the obliging sort and the day being my own, it was no problem, so I decided to wait until I was home before replying. I was negotiating a tricky roundabout/rotary when my pocket began pinging. One message after another, anyone would think the car was on fire. When I arrived home and looked at the phone, I blushed. BLUSHED like a prize tomato! My phone had taken a dizzy fit and decided to issue invitations to all and sundry from here to California (sorry Conrad!) to an address in Howth, Dublin. What I want to know is how it managed to pull phone numbers for names that were not consecutive in my list and send an address from a business card stored in my phone? There will be no Party in Howth, at least not one I know about. Especially since I am 125 miles away. Time to go, I don’t want to be late, I have had enough disasters already today. This entry was posted in Blogging, Friends and tagged Bloggers, Cell Phones, hairstyles, parties on June 26, 2013 by Grannymar. Brighid sent me a link to a very interesting post by Anne, last night, I thought many of you might like to read it. I suggest you read the article first before my thoughts below. I am no scientist, but the part about the medications, particularly statins, I certainly agree with. I was prescribed statins a number of years ago, and ended up almost bedridden, unable to stand upright and in constant pain. I could not remember what I was supposed to be doing half the time, though I put that down to my being in pain. Statins are cheap and that is why they are so widely prescribed. Two of my brothers, one in Australia and another in Dublin, had the same trouble as I had with meds. Each spoke to me at different times without knowing the other had done so. The common denominator for the three of us was a problem with Statins. I gave them the name of my replacement drug and told them to go back and talk to their doctors. Thankfully they listened and life has improved for all of us. There are people out there who are on prescribed medications , and without consultation buy over the counter rubbish because Joe Soap swears by it. They forget it can react in a bad way to the prescribed items they are swallowing. He has everything he needs to make it (except money). He is an experienced film maker, has the necessary equipment, has doctors lined up to do blood work, has amazing athletes to cooperate — presumably to consume green smoothies. All he needs to prove his hypothesis — that green smoothies enhance athletic performance — is money. If the evidence is so strong, how come some professionals are not ready to back him? The GMO argument is another mine field and alas, I do not know enough to make any claims one way or the other. I do know that every second person I meet these days seems to suffer from some allergy. Could new polypill save thousands of lives? The National Health Service (NHS) is our UK government provided health care. It shows how stories can spread like wildfire. In my grandparents day, they did not have modern medications and antibiotics, so depended on the local ‘healer’ for remedies. We had a book at home years ago of these ancient remedies and they would scare the life out of you. Enough from me, I need to make my breakfast. This entry was posted in Blogging, Health and tagged Allergies, Alternative medicine, Drugs, food, GMO’s, Health, Science on June 25, 2013 by Grannymar. Stir together grapes, capers, shallot, parsley and olive oil in a bowl; season to taste with salt and pepper and set aside. Combine the fennel, cucumber, avocado, red onion, coriander, honey, lemon juice, salt and pepper in a bowl. Allow mixture to sit 20 minutes before serving. This entry was posted in recipes and tagged food, Lunch, Recipes, Salsa on June 24, 2013 by Grannymar. 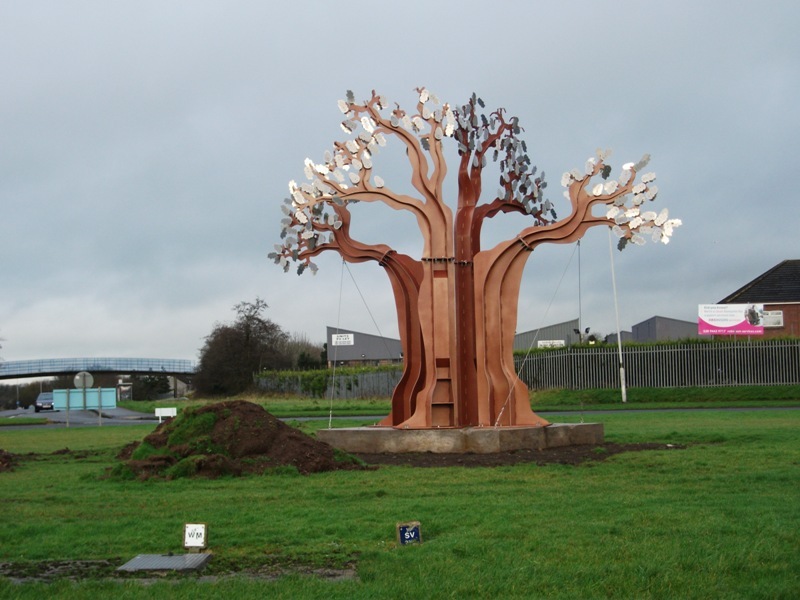 Back in 2011, Antrim Borough Council encouraged local residents to take part in an exciting, new project: A sculpture representing a mighty oak tree, to be erected at the roundabout at Greystone Road, Antrim. I found it during construction, but was unable to discover the back story until now. 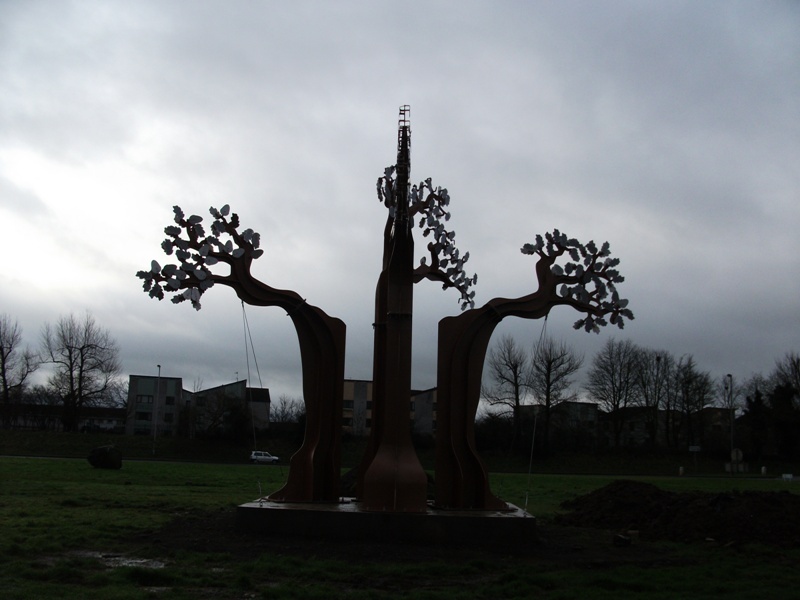 It involved working with artist, Alan Cargo, to create a large metal tree complete with engraved metal leaves. Each leaf was created by an individual member of the community with a design of their choice along the themes of Round Tower, growth, strength, and connections. 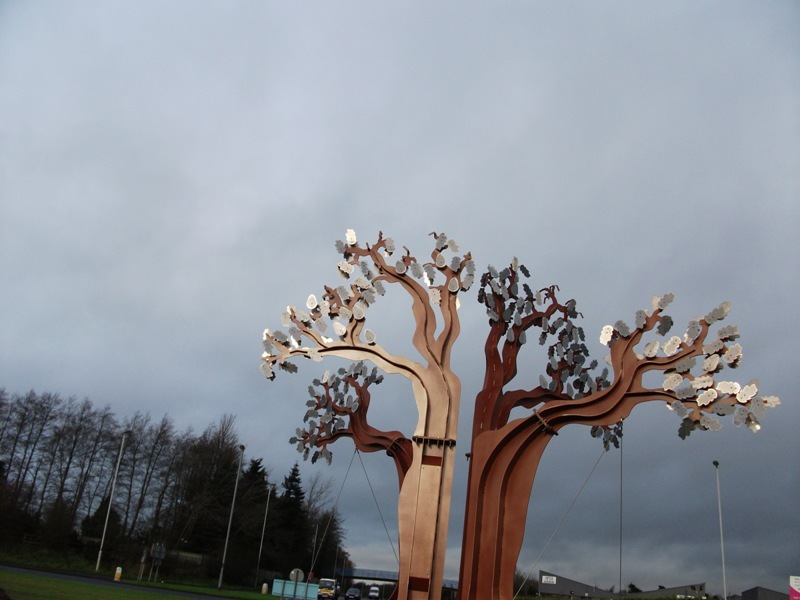 Unfortunately, because of the 7.5m height, and positioning of the completed sculpture on the roundabout, it was not possible to get up close to see the words and imagery on to the 320 stainless steel leaves and acorns. The project is part of the Positive Spaces programme, helping communities enhance their neighbourhoods with positive and cross-community public art. Almost a silhouette, to give an idea of the shape. Alan Cargo has for more than a decade successfully completed 25 large scale public art sculptural projects, and taken part in exhibitions both internationally and locally. He has lived and worked in England, Ireland and Africa both as a teacher and designer / maker of sculpture, and has traveled extensively in Africa, Asia and Latin America. He is currently a lecturer of 3D Design (Sculpture) in Belfast Metropolitan College. Commissioner, Antrim Borough Council / European Development Fund. The four parts of this sculpture line up to make a ‘great oak’ tree at one point of the viewers journey round the roundabout creating a sense of visual anticipation, and reflecting the somewhat fractured nature of the surrounding communities. 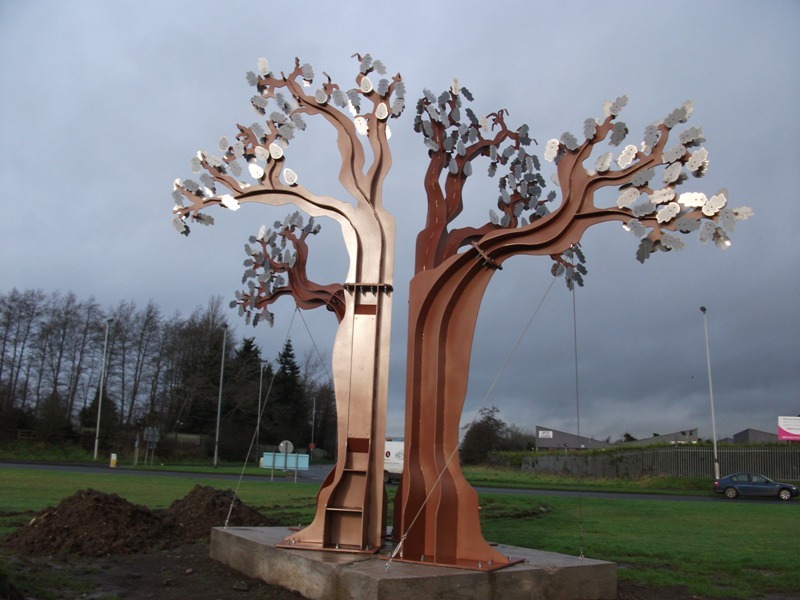 Direct inclusion of peoples words and imagery sand blasted on to the 320 stainless steel leaves and acorns advances the idea that community is strengthened when everyone can speak, words and imagery from workshops with 5 primary schools and 4 community groups are included. About four years ago, I wrote about a very different tree not far from this one. It was Brian Connolly’s The Healing Tree. When I discover how to pull over the approx 2,300 posts from my old blog, you will be able to dander through my sculpture series that began with the story of Dickie, Sam & Billy. If you scroll down the comments, you will find a comment from Brian Alabaster, the sculptor of the piece. I have to confess it is still my favourite. This entry was posted in Ireland, Photography, Sculpture and tagged Antrim, Little Acorns. Alan Cargo, Northern Ireland, Photography, Sculpture, Tree on June 23, 2013 by Grannymar. This river bank floods during heavy rain. 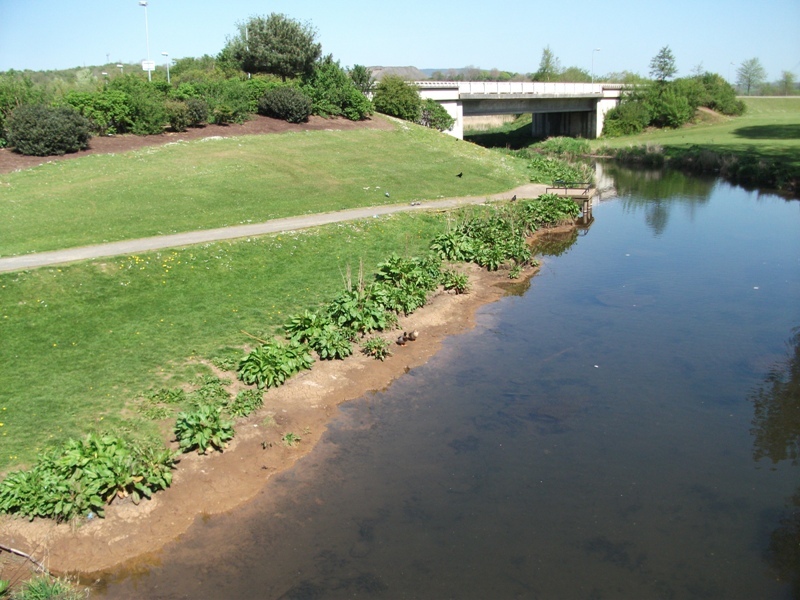 A popular home to a flock of Mallards, being close to a pedestrian bridge, parents with young children can often be found feeding the ducks. 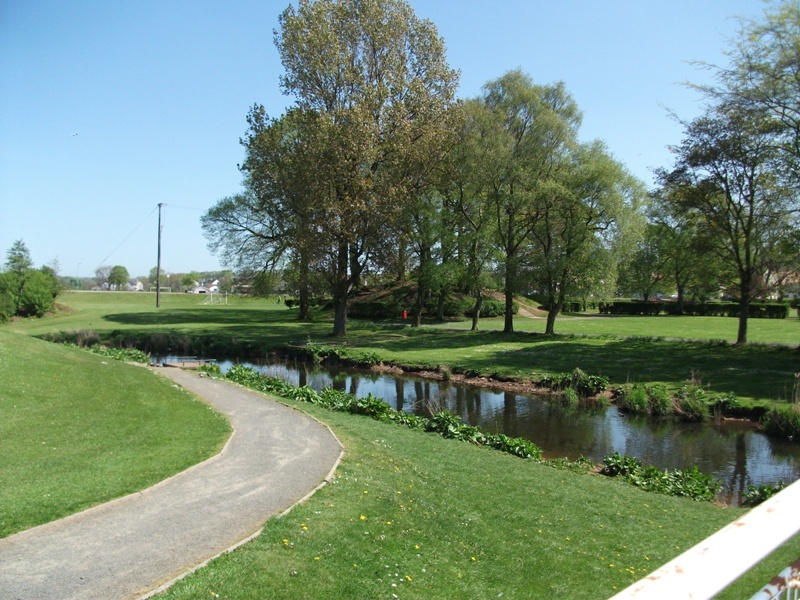 The green area to the right of the path fills with ducks as soon as a child appears. Our feathered friends are always hungry. 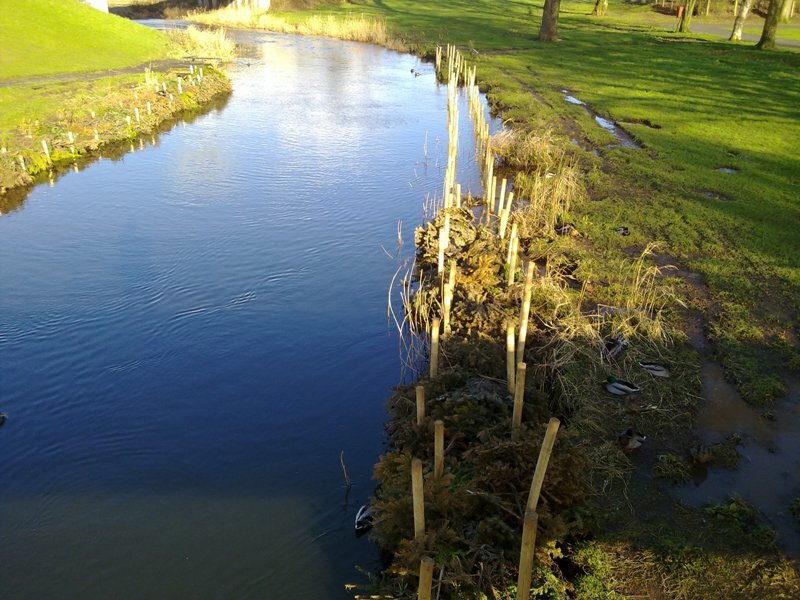 Recent attempts to reclaim the river bank. 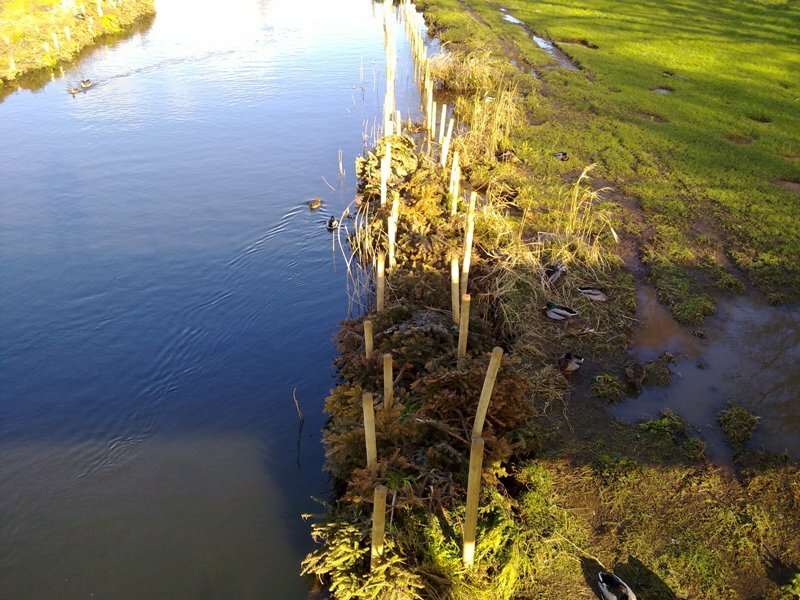 A channel is marked by wooden posts and filled with the pruned branches from local public parks. Discarded Christmas trees form a base. Discarded Christmas trees are used to form a base. This entry was posted in Alphabet and tagged Christmas trees, Reclamation, Restoration, Riverbank on June 22, 2013 by Grannymar. My heart felt like bursting I wanted to sing. I wished it kept going right down to my toes. Warm and gentle, so full of grace. A sensuous treat to make my eyes shine. Delicious sweet desire, a wonderful start. Our travelling romantic Delores, from Life on a Limb, found the perfect way to delve into the secret past lives of LBC members by asking us to write about: My First Kiss. I hope you notice that I have finally managed to list the members over there in the side bar, so if you fancy a few more kisses, skip along with me and see how many we can collect. Maybe with all this excitement it is just as well some are late on the starting blocks – my heart might go into shock otherwise. A kiss blown is a kiss wasted…the only real kind of kiss is a kiss tasted! This entry was posted in Loose Consortium Blogging, Poetry and tagged Kiss, LBC, Loose Blogging Consortium on June 21, 2013 by Grannymar.